Back-to-back at Pete’s 881 Club, looking to play more solid than the previous night. Called ahead and was told the place was full, so I watched some Mad Men to wait it out and headed in at 11PM. Literally takes less than a minute to get there. Got a seat, played for about 45 minutes, ended up +$280 in the green. Again got some questions since I was a new face. Older Asian guy on my right notices, asks me about my ethnicity, and found we share the grand Vietnamese heritage. Exchange a few words in Vietnamese before I said “oh and English only at the table!”, to which the dealer jokingly thanked me. Spent a couple of hands trying to gain some reads. A fit-and-fold shortstack on my left, seems a bit red-faced, letting loose some steam after work. Though I guess I was letting loose as well. Third guy on my left, really aggressive and spewing chips, also red-faced, call him Don Draper for the spitting image. Labor worker on my right. Alright, everyone downloaded. I pick up JQo in the small blind ahead of four limpers (calling preflop without raising). I push it up to 5x for $25. Everyone called. Not surprised, it’s a loose game, I should probably tighten up out-of-position. But no need, I flop trips! I could slowplay this, but I think I can induce Don Draper with a weak looking cbet. I bet $20, and he calls. Turns come an Ace. Then I induce harder. Induce, not seduce, by the way. I guess I’m seducing his chips. Wait, that sounds wrong too. Crap. Well, I just check to make it seem like I’m shutting down. Bait taken and trap set, he bets out $100! I put him on a pretty pure bluff, I’ve seen him shove with ace-high. I just call. I check in the dark like a baller, making it seem like I’m on a marginal hand. He bets out $120. I probably should have raised, maybe get a smaller J or an Ace to call. Hopefully, he had a bluff because I just called. Another hand with Don Draper. I have AQ suited in the BB. Don puts in his entire stack across the line, but then takes it back, leaving only $5. That’s a big no-no in poker, chips across the line are in play. But he’s off the hook as none of the players called it on him. I should have in hindsight, but I’ve seen people pull off that angleshoot (cheap moves exploiting loopholes in poker) with Aces, so I was immediately suspicious. I just check. I flop trips again, but I couldn’t induce any action. I make a full house by the river, but I didn’t get any value. Took down a small pot. So that move probably made me lose out on about $40. Drunk guy gets scolded for taking a picture of the table. Big no-no, taking pictures of other people at the table or the table itself. 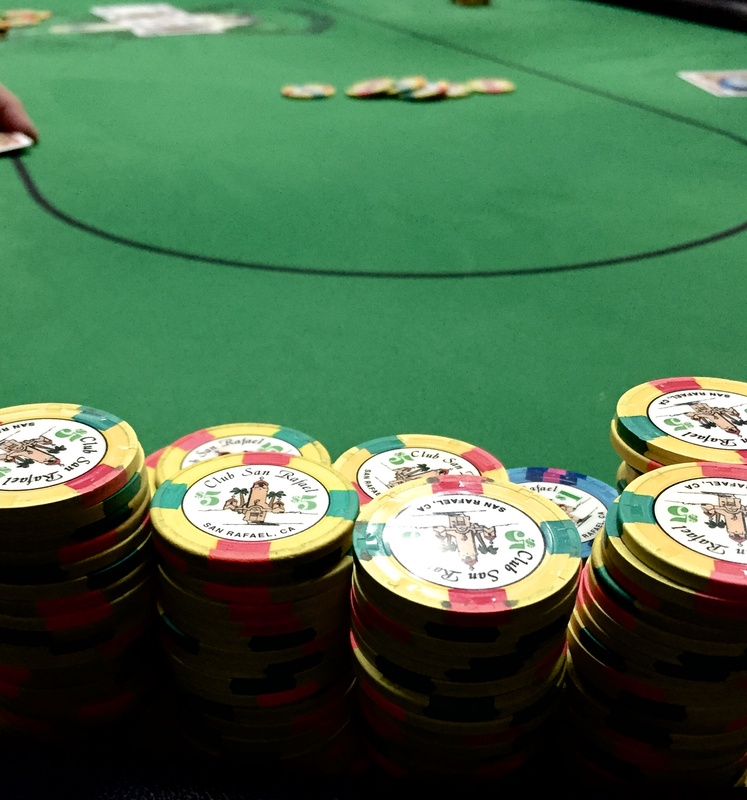 Though the dealer reassured it was okay to take a quick snap of your chipstack if you’re having a good night.